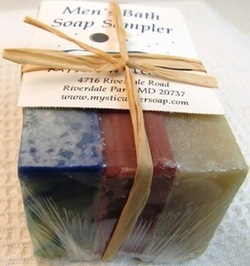 Please visit my website for men - that is where you'll find my shaving soaps, which are now shipping all over the U.S., Canada, and the rest of the world. Three guest-sized bars of soaps preferred by men (each is 1/3 of a bar). The soaps change from time to time. At this writing, (December 2018) the sampler includes Sandalwood, Cedar & Sage, and Irish Traveller. Individually wrapped and labelled, and bound with raffia, with a card. The same Bay Rum that scents my most popular shaving soap, here in a 20% shea butter soap. Clary sage, Virginia cedarwood, patchouli, lime, oakmoss and bergamot with nutmeg and cinnamon leaf – outdoorsy, masculine and complex. Icy blue peaks and swirls top this fresh herbal creation. “It smells like a good looking man” said one customer. Popular with men and women, this blue, green and white swirled bar is scented with our version of famous Green Irish Tweed fragrance. I've brought out a new Key Lime as part of my new line of 20% Shea Butter soaps - still, as before, beautifully scented with lime and May Chang essential oils. Brick red swirls in a 20% shea butter, scented with my own spicy essential oil blend with a generous amount of patchouli and sandalwood with citrus and spice notes that has been described as smelling like "the desert after a rainstorm". A delicate blend of tart lemon and freshly cut roses scenting the same 20% shea butter formula I developed for my Dry Skin Soap. Refreshing scent, and very kind to your skin. Real sandalwood essential oil is becoming extremely expensive and increasingly rare because of over-harvesting and illegal poaching. We use a sandalwood fragrance oil that has a persistent, sweet, and woody base note with a delicate, spicy, oriental undertone, very similar to real Mysore sandalwood oil. A shea butter-enriched soap colored deep red with Australian clay, with a white swirl and dissolved silk. My best-selling cocoa butter bath soap, Wild Lavender is scented with lavandin oil, a hybrid of cultivated lavender and wild spike lavender.